There is a silver lining in this Orwellian cloud. 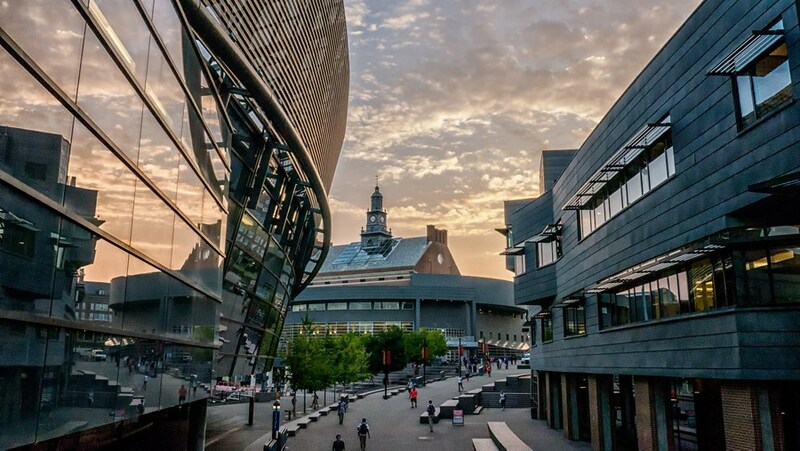 As of July 1, the University of Cincinnati will request a Diversity and Inclusion statement of all applicants for faculty and staff positions … new job postings related to staff openings will also require a Diversity and Inclusion statement. Diversity is the prevailing ideology of the declining West, and it is well that those attached to UC acknowledge that they must hold to Diversity’s tenets and that they will be responsible to assist in indoctrinating students into them. It is better to lay out in a plain and frank manner what is required of professors and employees up front rather than leaving the matter to occult and obscure whim. One likes to know where one stands. The requirement of the oath serves both UC in weeding out doctrinally impure candidates and it assists potential applicants to understand just what kind of hellhole UC seeks to become. There is no ambiguity for either side and this is good. Diversity is our weakness. It is a satanic (some readers may wish to capitalize the word) religion more bizarre than anything L Ron Hubbard ever thought up. Diversity is manic, corrosive, unChristian, divisive, weakening and most of all intolerant. Diversity requires strict unyielding uniformity of its adherents. Diversity insists that being a member of a victim group should not in any way be meaningful, but at the same time it requires every individual to self-identify and take pride in being a member of at least one group. Because of this, Diversity mandates rigid quotas for victims while simultaneously denying it uses these quotas. Considerations of Diversity apparently trump basic logic. UC insists in its Diversity Report that it will use quotas and “increase diversity in the confirmed undergraduate and graduate student pool.” It will also increase Diversity in faculty, and it “will develop and implement strategies to retain a diverse faculty through the probationary period leading up to and beyond the tenure decision.” Meaning, of course, group membership will count in granting tenure. The University will also give money to Diverse suppliers. A Chief Diversity Officer will be hired, and under this new (expensive) bureaucracy, the university will “Establish and monitor annual goals” in all Diversity areas. That “much more” is ominous. Since the limits of victimhood are not delineated, and because holiness signaling is bound to occur, victim groups can only expand, and what was considered “diverse” yesterday will seem reactionary today. This must lead to the well-known phenomenon of the left eating its own. The Diversity ideologues obviously are against real diversity such as accepting and empowering those individuals who don’t buy into their Diversity ideology. I live in Cincinnati. Some background for readers wondering why UC adopted this policy: Last year an unarmed black man was shot and killed by a UC police officer for what appears to be no reason. The tape is very clear that the man did nothing violent or threatening, and the officer is awaiting trial for murderl in what the county prosecutor called the most egregious shooting he’s ever seen. This policy was adopted following a lot of demonstrations from students and people in the city (the university is in a crowded urban area and people who are not students are frequently stopped by UC police). After the shooting, the police chief was replaced and a number of other changes were made. So this pledge did not come out of nowhere. Add to that that Cincinnati, a historically conservative city, has recently become a vanguard of socially liberal politics (the case that Obergefell v. Hodges was named for is from here) and the story makes more sense. A lot is going on. It’s hardly a beacon of free speech or academic freedom, but it didn’t come out of nowhere. The video I found of this incident was less than clear. I am not saying that anyone deserved to be shot, but it was not exactly a run of the mill traffic stop. The diversity that might be on the table for this video is not race. “People who do not drive with their license on them” is the diversity classification. Kinda getting into a theocracy here, aren’t they? Ladies and gentlemen, allow me to introduce you to fascism! Let us all join hands and sing, “Kumbaya”! Heed not the armed government happy helpers! They are here to ensure our diversity is untainted by, well, Diversity! We love everyone, only not, and have a lovely sense of the ironic, only apparently not. Remember tolerance and acceptance! Except for people who don’t think like us. Or whites. Or straight males. Or christians. Or Jews. Gaia help you if you’re a straight, white, messianic jew, male who values independent thought! I do not believe in this dominant ideology (Diversity) and am severely discriminated against as a result. This discrimination means that I am banned, for instance, from applying to be the Dean of the University of Cincinnati – a post which would command around $100k per annum. Perhaps someone in the US could take up my case on a no-win/no-fee basis?